The New Living Translation was translated by a group of 90 scholars who used the dynamic-equivalence philosophy of translation. This makes the text eminently readable, since it uses the vocabulary and sentence structure of modern English. More than 33 million copies of the New Living Translation have been distributed over the past twenty years, and it has been received with enthusiasm. Background of the New Living Translation Catholic EditionOver the past three years, every word of the NLT has been carefully reviewed by 12 Catholic scholars here in India. They have worked under the leadership of Rev. Dr. Lucien Legrand, mep and ably supported by Rev. Dr. Assisi Saldanha, cssr and Rev. Dr. Govindu Rayanna, who formed the core committee. The scholars read their assigned book or books in the NLT both to ensure that it is a faithful translation of the original texts, and to ensure that nothing in the text had been translated in a way that was contrary to Catholic teaching. As a result of this review, a relative handful of changes were made in the text of the NLT to improve the precision of the translation in English. After that careful and thorough review by the team of scholars, the New Living Translation was granted the Nihil Obstat by His Excellency, Gali Bali, Bishop of Guntur, who was the then Chairman of the CCBI Bible Commission. Finally, the NLT was granted the Imprimatur by His Eminence Oswald Cardinal Gracias, Archbishop of Bombay and President of the CCBI. 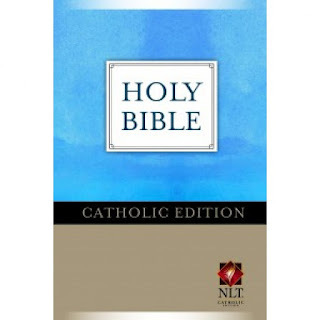 Importance of the New Living Translation Catholic EditionIt is a momentous occasion releasing the HOLY BIBLE, New Living Translation Catholic Edition (NLTCE) in the presence of the distinguished gathering. The release of NLTCE is historic because it is the first English Bible to be given an imprimatur by the CCBI in India. The effort is the result of collaboration between Catholic scholarship in India and the world’s leading Christian Publishers, Tyndale Publishing House, USA. It has been an ecumenical effort that spanned nearly three years. NLT is a “missionary translation” intended to present the biblical message in a language accessible even to non-Christians. The translation is both lucid yet solid in its presentation of the message. The Holy Bible NLT combines the latest biblical scholarship with a clear, dynamic writing style – communicates God’s word powerfully to all who read it. Following the principle of dynamic equivalence, it provides a refreshingly fluid reading of the Scriptures, which may be missing in more literal translations. It presents the biblical message in a language accessible even to non-Christians, as suggested by the Dogmatic Constitution on Divine Revelation, 25. This Catholic Edition of the Holy Bible NLT will be of great help for personal reading, study, and prayer. With its flowing text and useful marginal references, it will also provide a useful tool for Lectio Divina sharing and other prayer groups. Releasing of Books: Lectio Divina and The LectorFr. Rayanna Govindu authored two books namely, Lectio Divina and The Lector which were released on this great occasion by His Grace, Filipe Neri Ferrao, Archbishop of Goa and Daman and Vice President of the Conference of Catholic Bishops of India, His Excellency, Most Rev. Gali Bali, Bishop of Guntur respectively. These two books offer basic information about Lectio Divina and the training of the Lectors. Fr. Rayanna Govindu, executive Secretary of the CCBI Commission for Bible and the Member of the Core Committee thanked all the Office Bearers of the CCBI, the 12 scholars, Tyndale House Publishers, USA, ATC Publishers and Brilliant Printers, Bengaluru for their cooperation and collaboration. He extended his deep sentiments of gratitude to His Eminence, Oswald Cardinal Gracias for graciously granting the Imprimatur and for his timely advice and wholehearted support. He expressed his heartfelt thanks to His Excellency, Most Rev. Salvatore Pennacchio, Apostolic Nuncio to India and Nepal for his gracious presence and releasing the NLTCE, His Excellency, Most Rev. Gali Bali, the former chairperson of the CCBI Commission for Bible for granting the Nihil Obstat, giving a valuable Foreword and releasing the book “The Lector”, and His Excellency, Most Rev. J Susaimanickam, the present chairperson of the Commission for Bible for his invaluable suggestions and constant encouragement. He articulated his appreciation to His Eminence, Telesphore Cardinal Toppo, Archbishop of Ranchi for releasing the book ‘Liturgy and Life”, His Grace, Most Rev. Filipe Neri Ferrao, Archbishop of Goa and Daman for releasing the book “Lectio Divina” and His Excellency, Most Rev. Agnelo Gracias for strongly recommending the NLTCE for Iimprimatur. He also expressed his gratitude to one and all for their assistance. While thanking His Eminence, Archbishops, Bishops, Administrators fathers, dear brothers and sisters present for all that they have been to CCBI Commission for Bible, Tyndale House publishers, USA, and ATC Publications, Bengaluru, Fr. Rayanna earnestly requested them to promote NLTCE, and other books released such as, Liturgy and Life, The Lector and Lectio Divina. May the Word who became flesh bless us, nourish us, form us, guide us and fill us with his words of eternal life! Interesting. I wonder how this translation compares to the GNTCE. Here's a story about the new Bible from an Indian website with more info: http://www.daijiworld.com/news/news_disp.asp?n_id=386573 Some photos are there as well. I just communicated with someone from Hendrickson Press. Apparently, they're about to make decisions on reprinting loose-leaf Bibles. I put in my two cents for an ESV w/"Apocrypha". They could always make the Deuterocanonicals available as an add-on purchase. A guy can dream can't he? Anyway, it might be a great time to do a poll on what everyone wishes Hendrickson would publish as a loose-leaf Bible. You could always send them the results! Oh, how I wish there was a loose-leaf version of the RSV2CE or even the NABRE! Great news! I hope it is soon available here in the USA. I do a lot of work in the 12-Step recovery world and just about all the Christian-based recovery materials reference the NLT. It's been extra work to use try and adapt these to Catholic Bibles. As I understand it, no the USCCB doesn't need to give it an imprimatur to sell in the U.S. If I understand correctly, once a Bible receives the approval of a bishops' conference anywhere in the world (or the Holy See), it is therefore approved for personal use and study by any Catholic. If the USCCB had to approve any Catholic Bible sold in the U.S., we wouldn't have access to things like Knox, the catholic Good News Translation, the original Catholic Living Bible, or even the RSV-CE or Jerusalem Bibles. Our bishops would need to weigh in before it could be adopted as a LITURGICAL text in American worship. Notice that not even the Indian bishops are doing that. Nothing in the release states it's being proposed as a lectionary in Indian parishes. It's just a Bible translation for personal devotion and study. I was really impressed by the Catholic Living Bible from the 1970s in my research for last year's Catholic Bible taxonomy post (http://www.catholicbiblesblog.com/2015/09/guest-post-catholic-bible-taxonomy.html). I found it to be eminently readable, and a fine approved Catholic alternative to the Message. THIS edition, however, will be a very welcome udpate. Presumably the NLT does away with the jarring use of "Jehovah" in the original, which was my only substantive complaint about it. I think this is wonderful news. I know a lot of Evangelical Protestants who love the NLT for devotional reading purposes. It will be nice to have a Catholic-approved ecumenical translation that is accepted by Evangelicals and not just mainline Protestants. And I'm almost certain Christopher is right. The USCCB doesn't have to approve a translation for it to be "approved" for U.S. Catholics. Prior to the 1983 Code of Canon Law, any bishop anywhere could give approval to a translation in any language and that translation could be printed as a Catholic Bible and Catholics could freely use it for devotional and study purposes. With the great number of new translations in the 20th Century, the 1983 Code gave that job to national episcopal conferences. But, if one conference approves an English translation, that is then an approved translation for all English speaking Catholics on the planet. As Christopher also pointed out, liturgical use is an entirely different question. I, of course, do not know exactly why the approval is coming from CCBI instead of USCCB, but do we always have to assume that it's because USCCB is refusing to do anything? Should the USCCB be the only episcopal body that ever reviews and approves translations? Of course, the USCCB has a lot invested in the NABRE, but that's really quite understandable. And, I think it's very appropriate for other bishops conferences to be involved in the development and approval of translations as well. I'm very curious to know "which" edition of the NLT they used... The original kind of hokey in places 1996 or the much much better most recent 2015 edition? Of course there was the 2004 update as well. Oh and also minor revisions of 2007 and 2013! Lol! Lol!! I love the NLT! Just bummin that this Catholic edition won't be the latest NLT revisions but based on an outdated edition. Perhaps they were able to see the 2015 revisions and add them in? That is always a possibility. I am interested in seeing what changes they made to this edition. I emailed Tyndale to see if it would be made available in the US. I won't be too sad about not having an NLTCE cause I still think the translation is boring. Well, I think 'boring' would be a step up. I'm not too fond of translations like the NLT that try to make the Bible seem simple. That is misleading, the Bible is NOT simple, it is a very hard and difficult book, and misleading people into thinking that it is 'simple' is very harmful. I also disagree with the whole notion of dumbing down the Biblical text the way the NLT does. The RSV, ESV, and NRSV are written at an 8th-grade reading level. I don't think that is too outrageous, that makes them very accessible. But translations like the NLT and the GNT are written at about a 4th grade reading level, it makes me feel like I'm being talked down to. JDH, you make a good point that other bishops' conferences have a legitimate role to play in reviewing and approving bible translations. It's a monumental task, and one that often takes years. The USCCB understandably prioritizes the NABRE. To review additional translations for approval, it would probably need to set up a dedicated committee of scholars who are willing to carefully read and critique bible translations -- a tedious and costly undertaking. In light of that, I think it is fair to say that the USCCB has not attempted to review many complete bible translations apart from the NABRE. The Common English Bible publishing team stated that they were unable to even start the review process with the USCCB, and in a previous comment on this blog, Theophrastus mentioned that the same thing may have happened to the original 1996 NLT-CE, although he was unsure of the details. The list of approved translations on the USCCB website includes only three complete bible translations: the NABRE, NRSV, and GNT (or TEV). Of those, the NRSV and GNT were granted imprimaturs by individual bishops prior to approval by the USCCB, so I suspect that the USCCB did not undertake a complete review process for them. The rest of the translations on that list are either individual books of the bible (like the NIV Psalms) or translations of the New Testament, either of which would be much easier to review than a complete bible translation. It's a frustrating situation, but very understandable. I'm glad other bishops' conferences are expending the considerable effort to review new bible translations. Part of the reason that the USSCB has most of its resources and focus concentrated on the NABRE is due to the direction from the Holy See that has asked bishop conferences to put forward one, single Bible translation "in order that the faithful may be able to commit to memory at least the more important texts of the Sacred Scriptures and be formed by them even in their private prayer....The Conferences of Bishops are strongly encouraged to provide for the commissioning and publication in their territories of an integral translation of the Sacred Scriptures intended for the private study and reading of the faithful, which corresponds in every part to the text that is used in the Sacred Liturgy." --Liturgiam Authenticum 2.36. In connection with this the USCCB has been producing the NABRE, with a finalized version that fits this directive due in 2025. Being instruction from the Vatican, the USCCB has as its first responsibility ensuring that this type of Bible translation is available so that a uniform becomes the norm for American Catholics. The original intention of the US bishops was to have the NRSV at the center of an inclusive-language liturgy until the Holy See spelled out the current norms. With the NRSV no longer an imminent choice, the bishops invested themselves in reshaping the NAB into this primary version. The 1991 NAB Psalms, designed to play a prominent part in this inclusive liturgy, was the first to undergo revision in response, with the Old Testament following. The focus also went to revising the Grail to fit this new demand. As we now know the NT is now being redone in order to finish a new NAB that will be suitable not only for private use but uniform with the Liturgy as well. Thus it is understandable that the Conference has all its "eggs" in one NABRE basket, so that there may be one standard version of Scripture for all purposes for the Catholic Church in the USA as directed by the Holy See. "Thus, it is understandable that the Conference has all its "eggs" in one NABRE basket so that there may be one standard version of Scripture for all purposes for the Catholic Church in the USA as directed by the Holy See." But the directive you are referring to post-dates the NAB by several decades. 1. It is a source of revenue on the one hand and a way to save money on the other. Owning the copyright means that they get money whenever the NAB is used to make missalettes or get quoted by Bible scholars and theologians etc. Plus, not having to pay licensing fees whenever they want to quote from the Bible in any documents they produce saves them money. And switching to, say, the RSV, would end up costing more money than sticking with the NAB. But I don't want that to sound like I'm being cynical 'oh, they only care about money', that's not what I'm saying at all. I mean it more in the sense that St. Paul meant it when he insisted on making his living as a tent maker so he wouldn't have to constantly ask for donations. The NAB allows the USCCB to achieve a level of independence that wouldn't otherwise be possible. So they can focus on their ministry, and not spend all their time soliciting donations. 2. There's a little bit of a 'not invented here' syndrome. They are quite proud of this Bible translation that they have created, and they like to toot their own horns. There's maybe a little bit of nationalism in it too, as is reflected in the name, The New AMERICAN Bible. Liturgiam Authenticum is a finalized summary of instructions. The entire situation, if you recall, began in the 1980s back in the days when the USCCB was still called the NCCB. After studying the issue and making much preparation, the US Bishops published "Criteria for the Evaluation of Inclusive Language Translations of Scriptural Texts Proposed for Liturgical Use" in November 1990. A series of responses due to lively interchange between the Holy See and the NCCB and the CBA ensued, including most of the main points that now compose LA. LA developed from various situations due to English-speaking conferences wanting to incorporate the inclusive terminology and the NRSV. While the American Bishops were attached to the NAB project, they had no problem with letting it play second place to the NRSV. There was much hope due to the unprecedented ecumenical cooperation on the NRSV that it would be the one Bible text for all the English-speaking territories of the world. Such uniformity is what the US bishops wanted, even at the expense of the NAB to some degree. With the rejection of plans to incorporate inclusive language into the Liturgy by the Vatican, the USCCB went with what they had in their control, namely the NAB. The Psalter had just been revised in the hope of it being used in the Mass, but was immediately sent to the sidelines due to new directives from the Holy See. It was now 1991. By the mid to late 1990s, the US Conference had acquiesced and began to follow and incorporate the many directives from the Holy See that arose from these inclusive-language plans, including a new "one official translation" for use in the Mass. Prior to this other Catholic versions could be used in American liturgy, but after these discussions with the Holy See, as the 20th century closed, the bishops in the US introduced the revised NAB New Testament into the Mass, with a revised Psalter that did not reflect the 1991 NAB inclusive version. Apparently new "NAB-only" policy was not an invention of the bishops. Shortly after this LA was released, and it was now 2001. I cannot speak on the validity of your comments, nor am I challenging them. They are oft-repeated on the Internet. However, I was working for the Pastoral Offices of my diocese, closely under my bishop, and as you can imagine had somewhat of a front row seat to many things. While there was a problem around funding between the CBA and the bishops regarding the NAB, I cannot confirm that the NAB was chosen primarily due to pride in the work or that it was seen as a "cash cow" using the words of others. I can't deny this, but I never heard this at all from anywhere but the Internet. I only know that the NRSV was originally the version of choice. When that was gone, the NAB became the center of focus. To reiterate, in my post I was speaking regarding the chronological order of events. Most of us who have been following this have been doing so since the 1980s and know that LA was a conclusion and not the start of liturgical translation uniformity in response to inclusive language. LA was the final word on the subject, not the first, and I was quoting it to explain the choice made by the USCCB, a choice which obviously came from the Holy See even though LA was not yet released. But the USCCB was fully committed to the NAB long before the 1980's. While the NAB was being developed, the USCCB did also for provisional acceptance of other translations in the liturgy. According to the USCCB website, the translations approved for use in the liturgy in the US are the NAB, RSV-CE, Douay-Rheims, and the Jerusalem Bible. However, the website claims that the approval of these translations was only temporary until the NAB was finished, and the intention was always that the NAB would be the only translation allowed in the liturgy after that point. I had an (unofficial) NLT-CE years ago and while I like the dynamic translation, what I found objectionable in using/recommending it to most Catholics were comments in the intros and notes, not the translation. What particularly sticks in my mind is the introduction to the Epistle of James wherein they inform the reader that Our Lady had other children (if memory serves). I would hope that the official CE reviewed commentary/notes. I made my comments as a side point to support other comments on this thread regarding why the USCCB may be limited in resources at present to approve other Bible versions and why other English conferences are doing so, nothing more. The subject matter is the NLT release, and I would like to stick to that on this thread. If you find that various points I write about raise questions, why not go to the source itself? Anyone at the USCCB would be happy to answer your questions. There is always more than a possibility that I have written something by mistake. If you feel I must be corrected personally, you are more than welcome to have anyone from the USCCB set me straight. I would rather know the correct version myself than keep to something that is false. I'm more than highly fallible, and as a sinful human being far to be trusted.--John 2.25. Either way, the CCBI doesn't indicate that it's using the NLT-CE for liturgy, do they? It sounds like it's an "evangelizing" Bible for them. Whatever they use for their lectionary for mass presumably remains the same. Out of curiosity, does anyone know what text is read in Mass in India? For Mass in English, the CCBI employs the RSV-CE 2nd Edition as the official liturgical Scripture text. Actually the Liturgiam Authenticam made the way for the NAB to be the base texts for US Liturgy. With an existing version within USCCB's reach, there is no doubt that NAB would be chosen for Liturgy given the reasons Biblical Catholic presented. Just to remind you, the Catholic Bishops Conference of the Philippines granted imprimatur to the St. Joseph's New Catholic Version. It seems that the USCCB is reluctant on their imprimantur. Remember though that the NCV is currently just a book of PSalms and the NT, not a full Bible. As for those who dislike the reading level of translations like the GNT and NLT, I think you're missing an important point: emerging readers NEED a translation at their reading level. Whether for adults learning to read in English, or children, it's important to have access to actual scripture translated at a variety of reading levels. One of the worst mistakes Catholics seem to make is giving children "Bibles" that are simply colorful books of Bible stories, and then leaving their exposure to real scripture to the Mass readings. But when I was a United Methodist, I got my first Bible in second grade: the Good News Bible, which I kept - and read in its entirety - all the way up through high school. When I went to college, I "upgraded" to the RSV/NRSV, and now that I'm Catholic I rely on the NABRE. But when my own son celebrated his first communion, I gave him his own GNT-CE. It's not "dumbed down." It's translated with vocabulary and grammar complexity suitable for most English speakers fourth grade and up. When we needed to do lectio together for a scouting badge, that's the translation we used. It's better that kids see the Bible as something they can read themselves, and not something just for adults. I've been wondering what I'd give my younger son now that he's approaching the same age. If I can get my hands on one, the NLT-CE will suit me just fine. For a beginner to the Bible, reading a Douay-Rheims is a pain, I must say, a struggle at a mininmum. When I started to pick up the Bible around five years ago, through the prompting of the Holy Spirit, it was actually an NIV bible app in my phone that encouraged me to read the Bible. But being a Catholic of course, I decided to buy a complete Catholic version of the Filipino version of the GNT, which is used in the Roman Liturgy here in the Philippines. And I must say that reading through it, i became more acquainted and encouraged to continually read the Scriptures. And the rest is history. The important here is that your vigor to read the Bible to be first opened, somehow similar to a paranormal third eye. And when it starts to fuel, you will eventually find yourself pursuing the best version that will suit your preferences. In my case, I had literally made the journey from the dynamic side going to the formal side of the spectrum. That would explain my own little library of Bibles in my shelf. It is still better to have some version of the Bible to read, than not to read any at all. "For a beginner to the Bible, reading a Douay-Rheims is a pain, I must say, a struggle at a minimum." But that is precisely my point, reading the Bible SHOULD BE something of a struggle. The Bible is a very difficult book, I object to the idea of trying to make it seem easier than it is. When people get the idea that the Bible is 'easy', then they start thinking they can interpret it on their own without any need for the Church or the Fathers or commentaries or anything, and you wind up with people like Joseph Smith or Charles Taze Russell coming up with very bizarre interpretations and founding their own church. Tyndale and his 'plowboy' have done a great deal of damage. There is struggle with the content and struggle with the language. The first is good: it's the soul's response to the Holy Spirit's teaching. The second is bad: it's an obstacle to the Holy Spirit's work. Any translation that exceeds the literacy level of the reader is the wrong translation for that person at that time. But any translation of Scripture with language that a reader can understand can challenge the soul with its content. I wouldn't give your son the NLT just because I don't think there is much of a grade level difference between that and the GNT. Shortly after its release, I bought the US version of the Catholic New Living Translation, sold by Tyndale and printed in Italy. IMO, it could be slightly more Catholic (of course), but clearly does not oppose Catholic teaching. Small things still annoy, such as the paragraph headings which emphasize Peter's denial of Jesus but are absent in John 21 when Peter thrice re-affirms Jesus. Wisdom 2:10-20 is oddly translated in the plural, one of the very few modern translations to render it thus. Penned as late as 50 B.C. these verses are one of the most clear and precise prophesies/foreshadowing of Christ in all of scripture. Not all of the Protestant influence has been purged, but it is still a fairly good read. It is a definite step above the CLB and especially the GNT, where in John 2:4, the GNT has Jesus rebuking His mother! Back in the CNLT, Jesus' reply to the Samaritan woman in Mark 7:27 is definitely "hokey" as they have rendered it "Good answer!" - sounds like a TV game show. However, 2 Corinthians 2:10 is a good rendering, wherein Saint Paul forgave sins with "Christ's authority for your benefit." Not exactly in persona Christi, but close enough. So, a mixed bag - as are all translations. However, there are times when I simply need an easier read and this fills the bill rather nicely. Oh, as to the older Catholic Living Bible, the Deuterocanon stands out from the rest, as they were provided to Tyndale by Our Sunday Visitor. I quite like OSV's translation of Tobit, among others.